An industrial designer who trained at the Massana School in Barcelona. 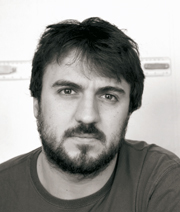 In 2005, he founded the 2-0 Diseño studio with Héctor Roqueta. "We design open objects: we create a system and users adapt it to their needs. At 2-0 we create designs that adapt to the person, not the other way round." The studio has worked with a number of companies in various sectors. Santa & Cole: Montana bike rack, Urbano Ramón ashtray; Miscel·lània: Rama side table; Escofet: Tronc urban planters; Vilagrasa: Ash litter bin/ashtray urban series; Balvi: Magnet knife holder, in addition to packaging, corporate image and product projects for various companies.